As 2016 starts it seems that farmers are looking everywhere they can to find cost savings. Fortunately, there have been some pretty significant finds in the area of fertilizer prices. The dramatic declines in oil prices have helped provide another area where some cost savings can be found. Diesel prices in particular are much lower than they have been for years. The USDA estimates a variety of price indices. One of these is for fuel prices paid by farmers. This index covers diesel, gasoline, and LP gas. The price index with 2011 serving as the base year is shown in figure 1. Here one can see that farm prices for fuels are the lowest seen since at least 2010. Prices rose quickly in the latter half of 2010 and remained high until beginning to fall in early 2015. Since then, they have continued to decline rapidly. The magnitude of these price changes is perhaps best seen by examining a graph of the percentage change in fuel prices over this time period. Figure 2 shows the percentage change in fuel prices for each month since January of 2010. The recent trends in fuel prices have been very negative. For instance, fuel prices have only increased in 6 of the 25 months since January 2014. The results have been rather substantial declines in fuel prices. For instance, from January 2014 to January 2016 fuel prices have fallen by 50%. From January 2015 to January 2016 the decline has been 30%. Figure 2. 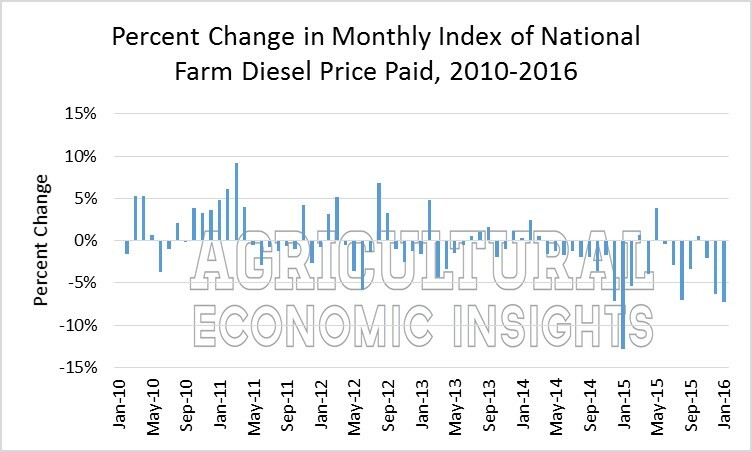 Percent Change in the Monthly Index of National Farm Diesel Prices Paid, January 2010 to January 2016. According to the Purdue Crop budgets, in 2014 farmers expected to spend $63 per acre on energy for continuous corn production on high quality farmland. Today, the estimate is $16 per acre lower, coming in at $47 per acre. Recent declines in fertilizer prices have gathered considerable attention and rightly so. In a recent post, we provided a fairly realistic example where a farmer could see savings of $32 per acre due to fertilizer price declines. Combined with these fuel price declines the amounts start to become meaningful. 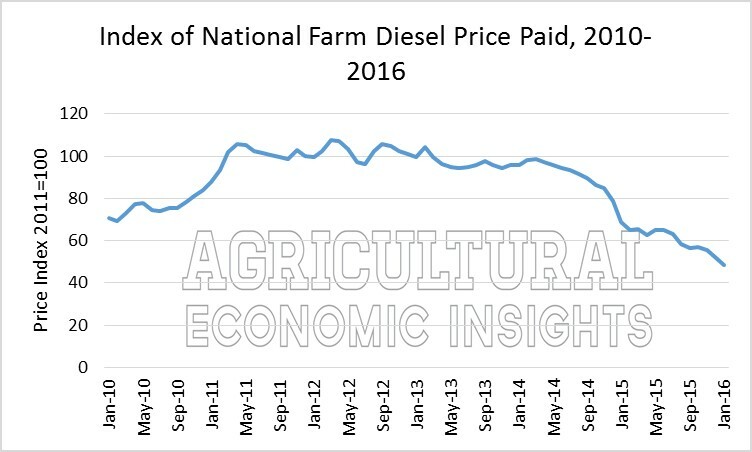 The magnitude of the savings that would be experienced by fuel price declines depends on the practices employed on the farm. In the Purdue budget the largest source of energy expenditures comes from grain dryer fuel. In other areas or with other practices the savings could be greater. For example, in some regions of the country farmers spend a significant amount on fuel for irrigation. A farmer that expected to spend $75 an acre on irrigation fuel in 2014 might be looking at a bill more along the line of $40-$50 per acre in 2016. Similarly those that rely on more tillage would be expected to see additional savings over previous years. On the other hand those that are less fuel intensive will benefit less. The decline in fuel prices has brought about some positive news for the farm budget situation. The extent to which these savings will add meaningful dollars to the bottom line depends on a variety of factors including the amount of tillage operations, the amount of crop drying required, and whether energy is required for things such as irrigation. While fuel prices have fallen considerably one must ask what these kinds of declines mean to the bottom line. Unfortunately, for most farmers the answer is not enough to restore profitability. However, it is an important step in the right direction. In this environment every little bit helps, and the cost savings can add up to meaningful dollars. In this environment we will take it.